Websites That get Business, Guaranteed! The Most Affordable Websites, Guaranteed! Website Ready in only 5 Minutes! Discover More	Try a Demo! Buy Website! 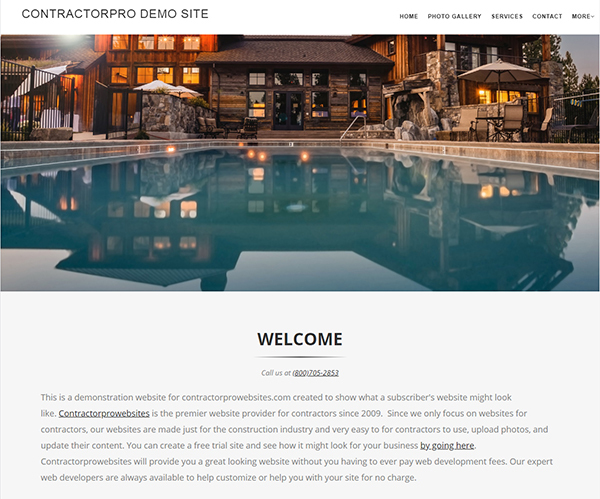 What is different about ContractorPro Websites? Our websites come complete and ready to go right out of the box. We provide a number of designs to choose from, each one has the content and pictures already on your website. This alone will save you hours of work by providing a crucial foundation for your website. Content creation is one of the most time consuming aspects of any website. No one else will write your content for you like us! There are also no upfront setup fees or contracts. We charge monthly and you can cancel at any time! 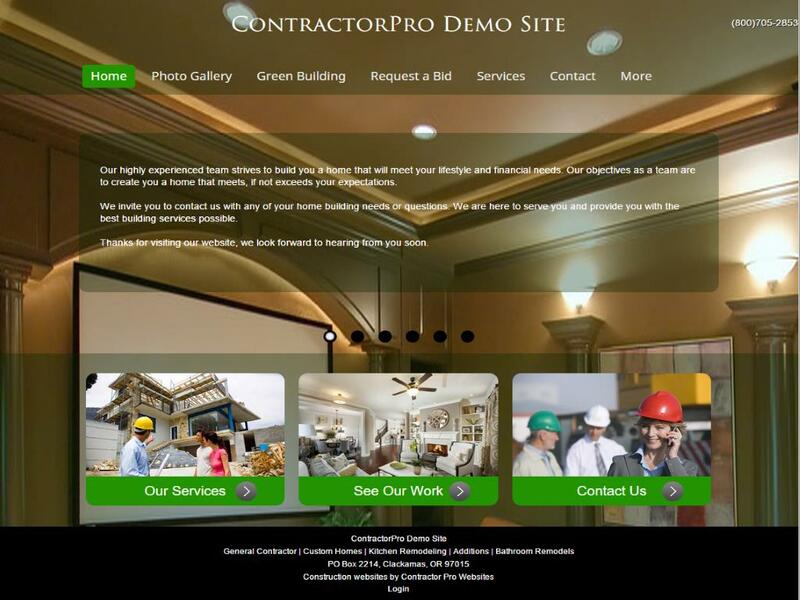 Our websites are designed and created for contractors, builders, landscapers and other construction professionals. We make these sites specifically with you in mind. We don't want your site to just look good, but also function well. ContractorPro Websites also aims to ensure we get your website ranking high in the Google searches for your services and in your local area. A main goal of your website should be to help provide you new business, and that is exactly what we do for you! 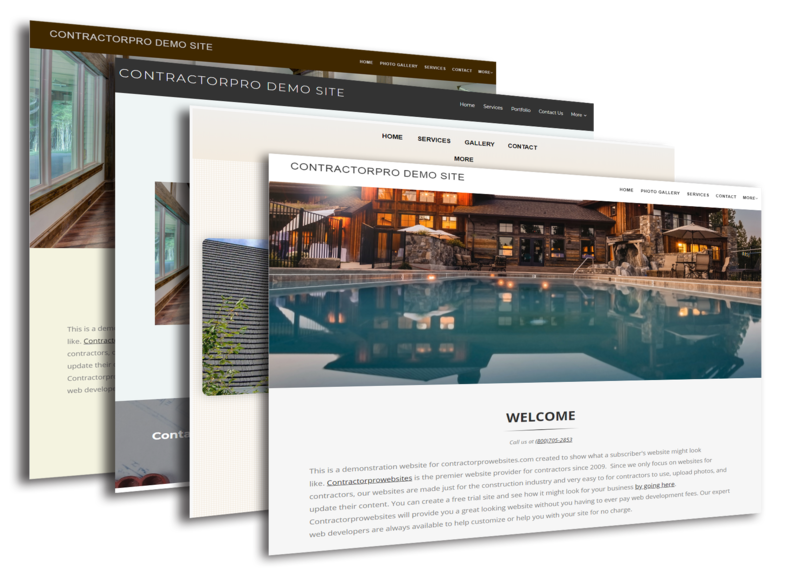 ContractorPro Websites has been specializing in websites for contractors for over 10 years. We have made it our business to help you grow your business through a website and online marketing! 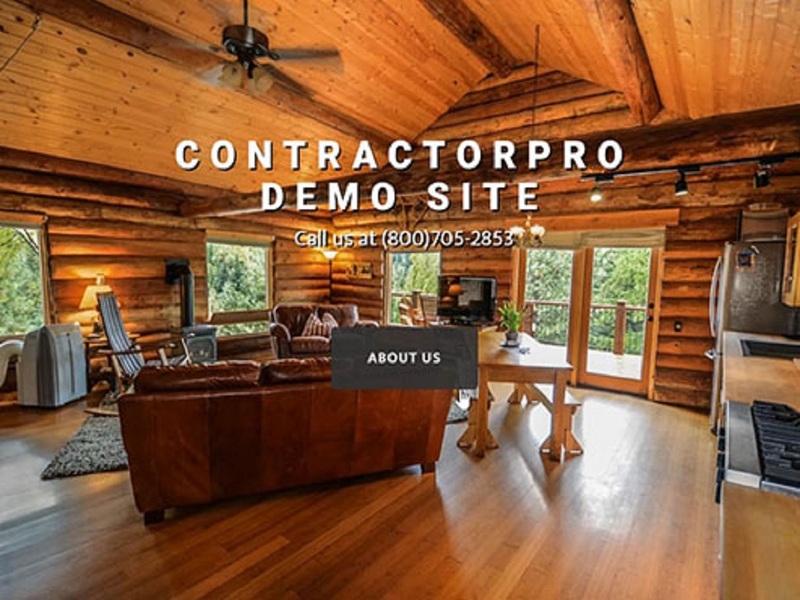 ContractorPro Websites has helped countless contractors, builders, handymen, painters, electricians and more start their very own website in just minutes. We are here for you and for your success. It has always been, and always will be, our mission to not only provide you with the best looking website, but also a website that works for you and ranks well in Google. Our support team will go above and beyond the basics and ensure we help you get anything on your website completed! 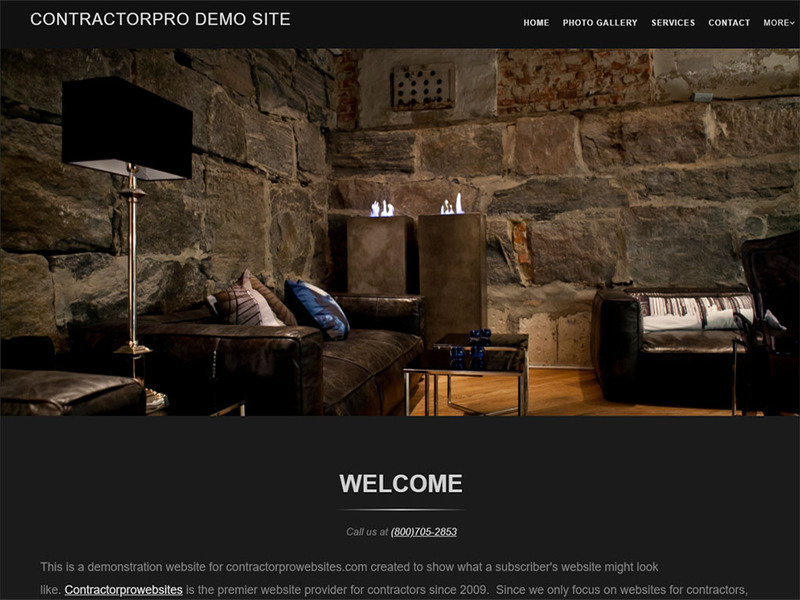 ContractorPro Websites is not like any other contracting website provider out there. Unlike us, most website companies will work in 2 distinct phases. 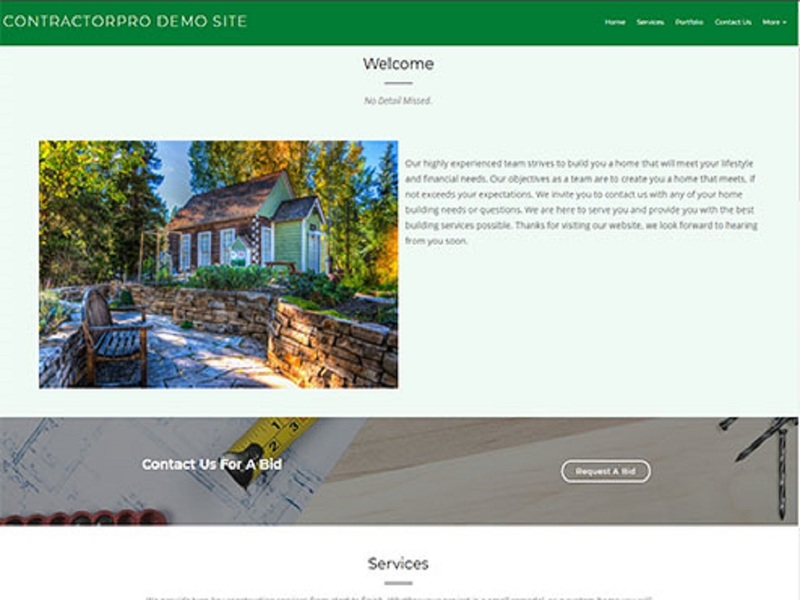 Before the site can go live, they design your website for you. This can take anywhere from a couple weeks to a couple months and it can become very expensive. $1000-$5000 design fees are common in other businesses. Not here! 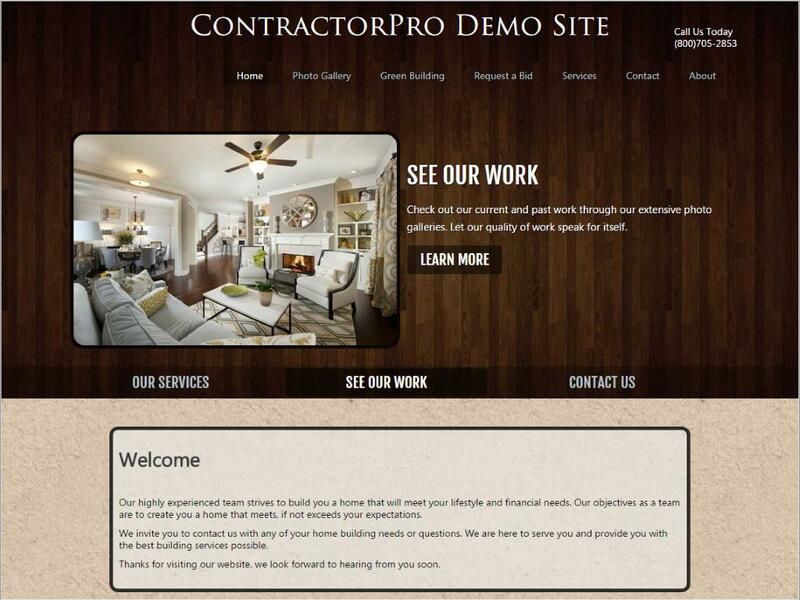 ContractorPro Websites are already designed for contractors. So our sites are ready to go online instantly and there are zero design fees! Websites Ready in only 5 Minuntes! Seriously! 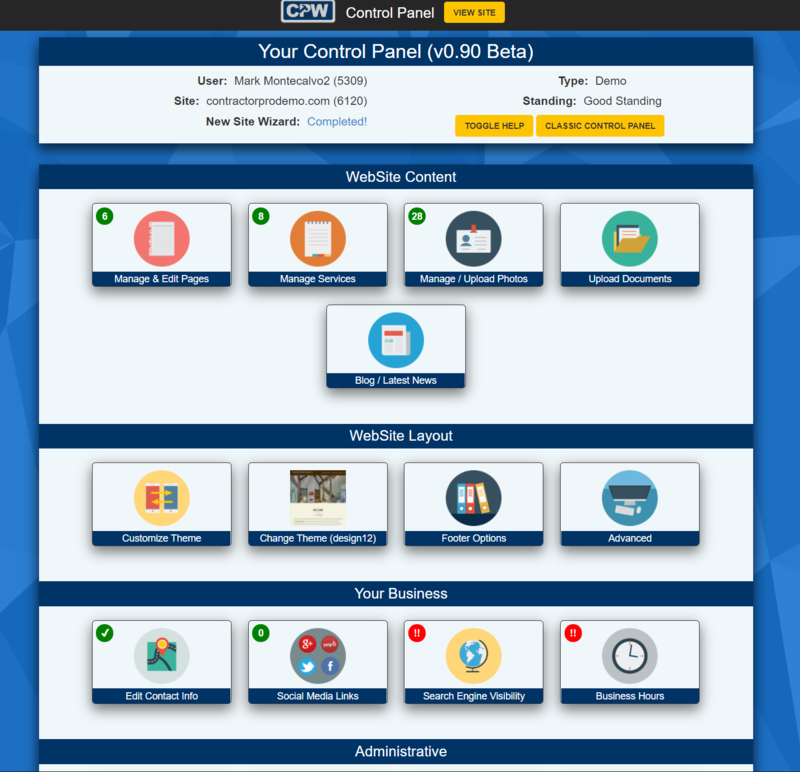 Utilizing our default content, it only takes 5 minutes to create your website. You can always continue to edit your website at any time in the future, but setup is a breeze. While other websites for contractors will want to charge you massive web design or setup fees in the thousands of dollars, we have no setup fees and absolutely no contracts. You can cancel at anytime and you won't pay anything to get your website started. There is no catch, we are simply here to provide the best website possible for you. Period. Our easy to use online website editor was designed with the expert and novice website user in mind. Whether you have made your own website before or are brand new to websites, we have the web site editor for you! With many easy to use and graphical based tools, you will have no problems. We are also always here to help in case you get stuck! Our world class support team is absolutely always here to help in whatever it may be you need assistance with! You won't be left in the dark like many other companies with unhelpful email replies pointing you to their help files. We have live people available via phone or email to walk you through any problems you may be having with your website or making the changes on our end for you! We have NO extra charges for any of our support! Our team really understands search engine optimization (SEO). This means we know how to get sites into top listings in Google. Rather than bragging and arm waving, let us prove it to you. Take our own site, for example. Click here to see how we rank in our own search. After all, if a company cant even get their own site ranked, how do you expect them to do for your site? Our highly skilled support team is always here to make sure your website is working and effective for you. We are experts in making websites for contractors. All of our modern looking designs are created with lead capture, looks and reliability in mind. Our sites are designed to get you business as well as rank at the top of the search engines. Your site won't fall behind as we are constantly making updates and new templates! Above is a screenshot of our editing software. We have made editing your website as simple as possible with more advanced features for modifying your design within! Not only have we designed your website to get to the top of Google and other search engines, but our expert SEO team is always here to help ensure your site is ranking well and getting you business. Your websites comes pre-loaded with professionally written content that describes your service, builds trust with potential clients, and has you stand out as a leader in your field. Launch your site now and do no more. Or easily add, edit, and delete your own content. Our high-speed servers and advanced web hosting service ensure that your site will be functioning 24/7. Night or day, you can rest assured that your website will be there when your clients go looking for you. We also provide site maintenance and security updates to your site to prevent problems and keep out hackers. We guarantee complete satisfaction - or your money back! 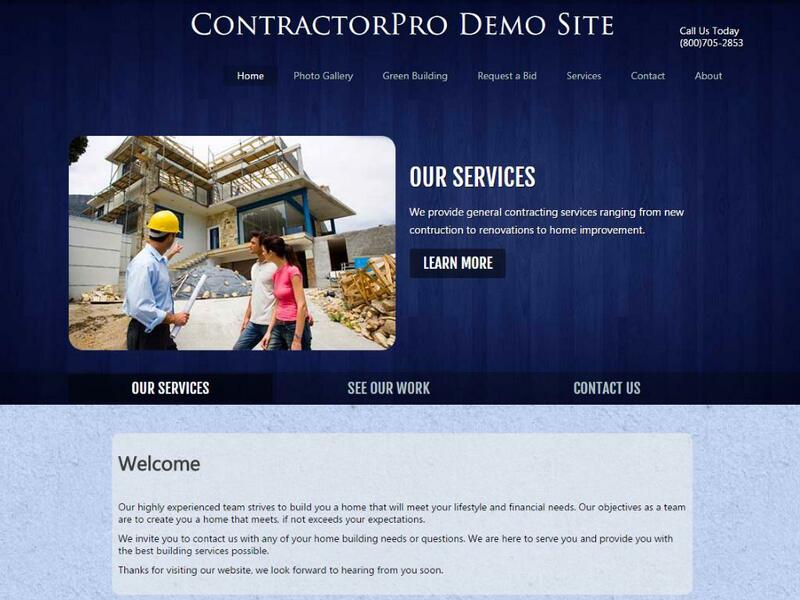 Contractor Pro Websites are backed with a 30-day 100% satisfaction guarantee. We give our customers a full 30 days and if they don't absolutely love their website, we offer a 100% refund on the spot. No fine print. No strings attached. Search Engine Optimization (SEO) is the process of optimizing key elements of your site so that the search engine robots find terms that rank your site higher in the rankings. We are experts in SEO techniques and provide multiple levels of SEO to make sure your site ranks well in search engines such as google, yahoo, and bing. You'll receive an unlimited amount of customized email addresses. We'll even have your new mail forwarded to your current email address. Increase your professional image without any of the hassle. When you set up your ContractorPro Website we will buy your Domain Name, a $19.95 value. If you already own one, we'll help you transfer it. Plus we'll pay for its renewal year after year for as long as you as we maintain your site. See 8 of our 30+ designs below. Click the image to preview a full site in the design. 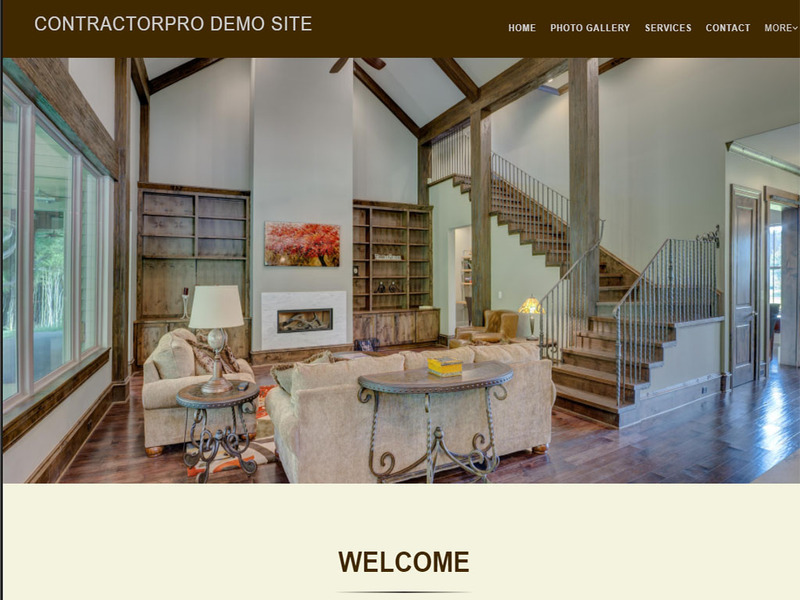 We are a custom home builder and there has been no better way for us to show off our work than our website with ContractorPro Websites. The support is professional and friendly and our site functionality is fantastic in allowing us to showcase all of our jobs. As a general contractor this site let me showcase my previous jobs with multiple photo galleries. It also helps me obtain bids on new projects as all my work is displayed in an organized manner right on my website. 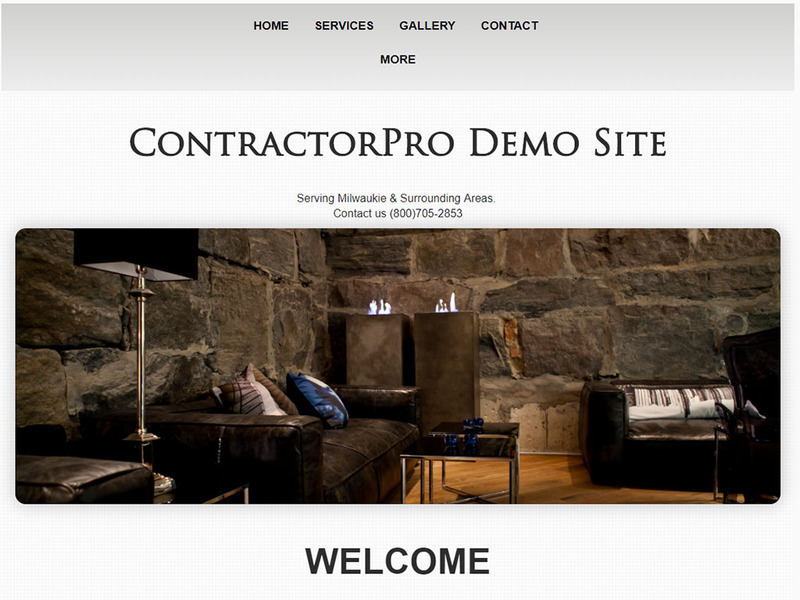 I have always had a successful contracting business and never thought I would need a website. After adding this professional website I have been able to bid more quality jobs and really increase my overall revenue stream. Copyright 2018 ContractorPro Websites. All Rights Reserved.